If your mental image of coral reefs is one of lifeless rocky outcrops on the ocean floor, “Saving Atlantis” will correct that misconception. If your mental image of marine scientists is one of unfeeling, robot-like observers recording data without any sort of emotional involvement, “Saving Atlantis” will correct that, too. Oregon State University’s first feature-length documentary tells the story of the rapid decline of coral reefs around the world through the eyes of the people who depend on them and the scientists who are fighting to save them. The 76-minute film, which will have its premiere in three free screenings over the next week (see box on Page A2 for details), takes a deep dive into the topic with compelling underwater photography that gives viewers a virtual tour of reefs around the world in places like Colombia, Saudi Arabia, Polynesia, Hawaii and Australia. Narrated by actor Peter Coyote, the award-winning voice of several Ken Burns documentaries, “Saving Atlantis” describes the life cycle of corals, small colonial organisms that live in equatorial regions and gradually build up massive undersea structures that, in turn, provide habitat for up to 25 percent of all marine species. The film lays out some of the major threats to reefs, from overfishing and pollution to climate change and ocean acidification, and makes the potential impacts of the problem personal through interviews with fishermen, schoolchildren, indigenous elders and others whose lives are intimately intertwined with these vanishing ecosystems. The project began a little over three years ago with a research grant awarded to OSU microbiologist Rebecca Vega Thurber, an associate professor who studies coral diseases. She brought in Oregon State Productions, the university’s filmmaking arm, to make several short online videos about her work. But the pace of coral bleaching events around the world was accelerating rapidly, and the team decided to produce a single long-form film to call attention to the problem. “You can engage someone much more deeply at an hour or an hour and a half — it becomes an event,” said David Baker, who wrote the script for “Saving Atlantis” and co-directed the film with Justin Smith. “That might help spread the word about the changes that are taking place.” The situation is dire, according to Vega Thurber, who notes that more than half the world’s coral reefs have already been lost, a quarter of all coral species are threatened with extinction and once-rare mass bleaching events have become an annual phenomenon. “In the 2016 bleaching event, one-fourth of the Great Barrier Reef was lost,” she said. That passion comes through loud and clear in “Saving Atlantis,” not only from Vega Thurber but from a number of other researchers interviewed by the filmmakers. The result is a tone of urgency not often heard from academics. 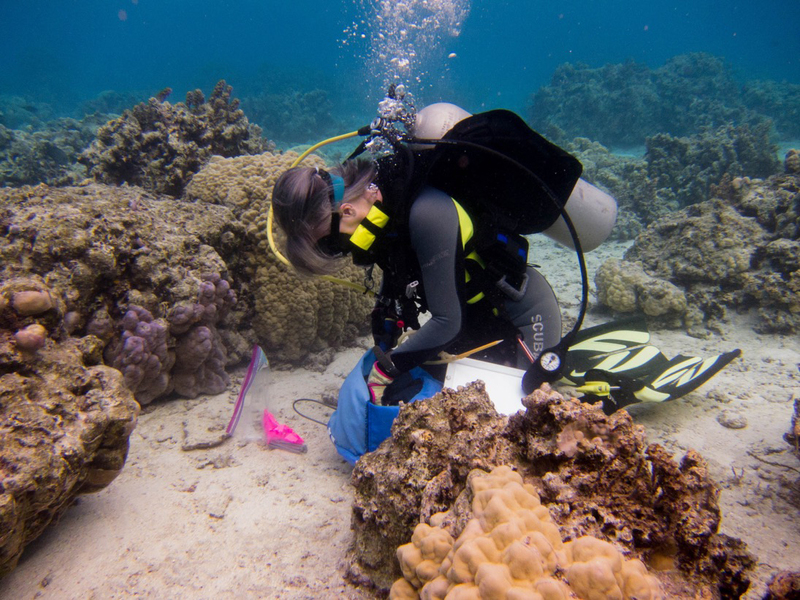 As a scientist, Vega Thurber admits she was a little nervous about being perceived as biased, but she believes the threat facing coral reefs warrants a clear call to action. “It is very, very hard to work on coral reefs right now and not be emotionally affected by it, because we’re seeing our places die,” she said. “We’re supposed to be objective, and our science is objective,” she added. “But we’re kind of at a precipice right now. If we don’t do something really quickly, scientists who study coral reefs may be out of a job real soon.” In addition to three free screenings around the state tied to OSU’s 150th anniversary celebration, the documentary is slated to screen at two film festivals. The filmmakers are also trying to get Oregon Public Broadcasting to air the movie and are hoping to land a distribution deal.